Have you ever dreamed of owning an exclusive Balenciaga bag but lack the thousands of dollars to actually purchase one?Well, chances are you already have a version of this in your closet at home in the form of an Ikea bag. Instead of a cheap knockoff of an expensive bag, the new Balenciaga bag looks like a pricier version of something costs 99 cents. 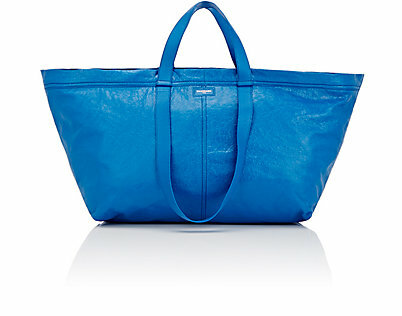 The new Arena extra large shopper tote made from blue wrinkled glazed leather looks to be an almost perfect replica of the large shopping tote from Ikea. The one notable difference is $2,144. Ikea is loving this new high-end bag copy of their classic design and told the Today Show: "We are deeply flattered that the Balenciaga tote bag resembles the Ikea iconic sustainable blue bag for 99 cents. Nothing beats the versatility of a great big blue bag!" But it's a little less versatile because if something happens to the Balenciaga bag you can't run right back to the store and get another one. Unless, of course, you're Mark Zuckerberg.